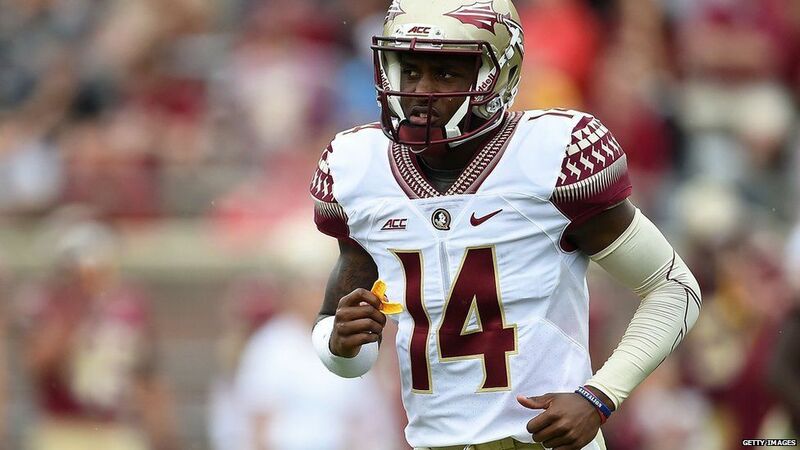 Jimbo Fisher and the Florida State Seminoles dismissed freshman quarterback De’Andre Johnson Monday night, after the State Attorney’s Office released a video that showed Johnson punching a woman in the face at a Tallahassee bar in June. Fisher made the announcement during a short statement released by FSU on Monday night, just hours after the video was made public. Johnson was named Florida’s “Mr. Football” during his senior year at First Coast High School in Jacksonville. Johnson was competing for the starting quarter back role this spring. In June, he was indefinitely suspended from the team when he was charged with misdemeanor battery for striking a woman during an argument. Johnson surrendered to Tallahassee police on June 30, and was released on $500 bond. Florida State president John Thrasher, said he fully supports the actions that head coach Jimbo Fisher took when he dismissed Johnson from the program. According to the Tallahassee Police Department incident reports, the woman, who is also a student at FSU, suffered bruising near her left eye, swelling to her upper lip and left cheek, and also suffered a small cut near the bridge of her nose. On July 2, Johnson’s criminal defense and trial attorney Jose Baez, entered a written plea of not guilty on Johnson’s behalf. “While it is clear from the video that De’Andre Johnson was not the initial aggressor, his family wants to take the lead in helping him learn and grow from this experience,” Baez said Monday in a statement. “He is currently participating in community service and faith-based programs focused on battered women, substance abuse and the empowerment of children. Johnson’s first court appearance is scheduled in Leon County Court on July 22.